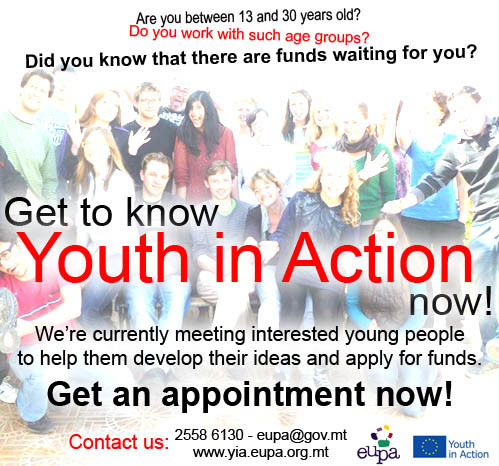 On behalf of the Youth in Action Programme I would like to inform you that we are meeting all young people who are interested in applying for funds under the Youth in Action Programme. If you are interested, or if your project proposal has been rejected for some reason or other we would like to meet you in order to help you get funded the next time round, which is going to be the 1st October 2012. We are eager to help you develop a project that could be funded by us, in order to help your organisation attain funds, and produce a good project which is fun, full of activities and will help develop the young people in your organisation or Locality. If you need any help please do not hesitate to contact us at any point on 25586120 or by email. We shall also be organising an information meeting sometime in the coming weeks, however we will contact you with the date, time and location. Visit our youth in action facebook page and press like in order for you to find the latest updates and information meetings.